Those who support beginner programmers. They are at the centre of all Mu related development. In order to understand how Mu can best support our users we need to learn about their needs, world view and how this reflects upon and influences their experience of using Mu (hence the name of this section). This includes taking into account cultural differences, special educational needs, level of education and other aspects of a person’s life that may impact on their accessibility to technology. These are not problems to be “solved”. Rather, this illustrates that Mu is an application to be evolved in a way to inclusively address the needs of users. As a result, it is important to keep Mu simple so that it is easy to make the inevitable changes needed. It’s also important to point out that we will make mistakes and may need to revise how Mu works. Therefore Mu should be simple enough that it is easy to fix. It’s important to differentiate between design and usability. Plenty of software looks beautiful but is difficult to use. With Mu, we aim to put usability and a great experience before looks. 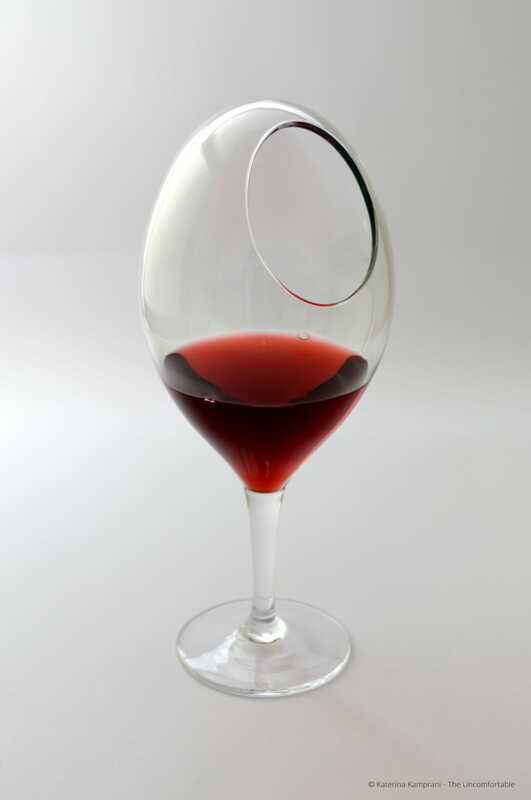 This beautiful yet inconvenient wine glass from the uncomfortable illustrates what I mean (used with permission, see Copyright Information). I have some wonderful friends in the tech world and one in particular, Ann Carrier, was kind enough to explain her work in “user experience” which I’ll reproduce below. It beautifully captures how I’d like user experience to relate to Mu. I sent her a series of questions to help me understand what I needed to do to bring about great UX in Mu and Ann gave some great answers. What is UX and why is it important / useful? UX is short for User Experience. User Experience means the overall experience of a person using a product such as a website or computer application, especially in terms of how easy or pleasing it is to use. It’s a really important part of the process of creating a product for people to use. It focuses on finding out about the needs of the people who will be using the product or service. This can also include how they behave, or what they do right now to achieve whatever it is they need to do. Once you understand this, you can then go about the process of designing something to meet those needs. You can even include users in the process through interviews, usability assessments or other workshops. There is absolutely nothing better than seeing people use a thing you’ve designed to help you figure out all the things you haven’t quite got right! Can you describe the processes and techniques you use as part of your job? I start with research. That takes many forms. Whether it’s desk research into the latest apps or design patterns, or into the other products in the area we want to build a product in, or speaking to the people who are going to be using the product, this stage is vital. Once we have a better idea of the problem we’re trying to solve, and the context which surrounds that problem, we can begin to try and solve it. There are many ways to do this, but I always find it helpful to draw things out. This is especially helpful when you’re working in a team. Having a diagram (even if it’s just boxes, lines and dodgy handwriting) that everyone can see and suggest changes to helps you know that everyone has a shared understanding. Once we have a shared understanding of the problem, and if there is one, the current workflows or processes we can then begin to look ahead to how this thing could work, in a magical perfect world that in reality, rarely exists. When we have this, we can then look at what steps we are going to take to get there. This allows us to have a firm “North Star” in mind, and with every step, re-assess not only whether that’s the same direction we want to keep going in, but whether or not any solutions will take us closer towards, or further away from it. At this stage, we can and should also write down the success criteria - in other words, how will we know this is working? 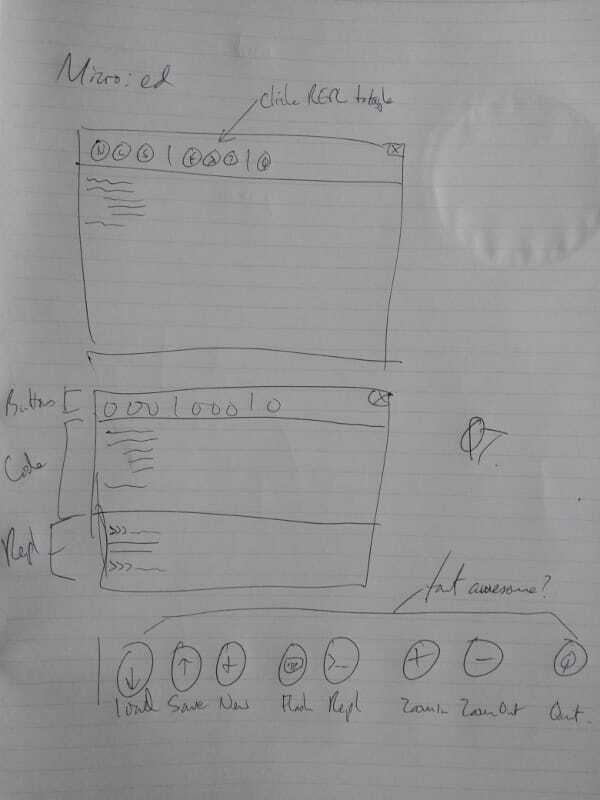 Next up is sketching out ideas for how the interface will look. Coming up with lots of ideas at this point is really useful. The first idea you have is rarely the best, so it’s good to try and get a lot of ideas on to paper so that you can figure out the best ones. One technique you can use is to try to come up with 6 different solutions to a problem. And if you’re struggling to come up with all 6, then try things like solving the problem the opposite way to the last idea, or something completely wacky. It’s amazing how useful this can be. Sometimes, the right idea is just a tiny bit to the side of the absolutely wrong way of doing a thing. Sketching doesn’t need to be just done by designers, and you certainly don’t need to be an artist. As long as you can draw boxes and arrows, and your handwriting is neat enough that you can read it afterwards, you’re good. The point of a sketch is to communicate an idea. If everyone you’re working with can understand what you’re trying to describe with the sketch, then that’s all it needs to do. Once you’ve got more of an idea of what the solution will be, and talked that over with anyone who needs to be involved (Product Managers, Engineers, Testers, Users) then you can move on to more high fidelity designs. These are called mockups and they show what the user interface could look like, once it’s been built. Even at this stage, changes - known as iterations - can and will still happen, because at every point you’re finding out more and more and refining your idea, until you get to the point where it’s built and in the hands of your users. How does your UX work fit in with the wider software development project? In a good team, UX people are involved the whole way through, from the first ideas, through research, exploration of solutions right to the end when the product is out in the world. That said, user experience isn’t just the responsibility of people with UX in their job titles. Everyone has a part to play in delivering a good user experience to the people using the product. What advice would you give to people doing UX for the first time? If a good carpenter’s rule is “measure twice, cut once” a good rule for UX people is “listen more than you talk”. Do your research. Find out about the people who will be using the product. What they need. What they want. What problems they’ve currently got. How they work. Then keep talking to them as you design and build. Is there anything else we should know about UX that’s not been covered by your answers to the above? This gives you a great set of questions to ask of yourself whenever you’re approaching a project. does the solution solve the problem for the people who need it? The “story so far” of Mu and UX starts with Carrie Anne Philbin’s (director of education at the Raspberry Pi Foundation) keynote address to EuroPython 2015. This formed the basis for usability decisions when Mu was first created. While running workshops to test a browser based editor for the BBC’s micro:bit, we’d heard from teachers that while the browser was very convenient in terms of setting things up, it was a pain to have to continually download scripts and then copy them onto the device and they also wanted easy access to MicroPython’s REPL. I wondered “how hard can it be?” and set out to create an editor based on Carrie Anne’s comments about the needs of teachers and learners when it came to code editing. She starts by explaining the problems with online editors. Often they require users to sign up, thus excluding a large number of children who, for legal (child protection) reasons, are not allowed to sign up because they have not reached the minimum age (usually around 14 years old) for them to be allowed to create their own accounts. Online editors introduce bureaucratic problems too: often schools use a “whitelist” system with their firewalls - they block everything except those sites on the whitelist. Getting a site onto the school’s whitelist is often an onerously bureaucratic and slow task. Furthermore, assuming the website is available, many online editors expect their users to have access to modern hardware and browsers. This is often not the case and intractable technical problems result. Finally, a significant minority of children still don’t have access to the internet, even in relatively advanced countries like the UK. For these reasons, a native developmnet environment is preferred. Carrie Anne then explores two offerings for students to use as native code editors. PyCharm has an educational edition that is both free and open. However, Carrie Anne claims it’s not very obvious for either beginner developers or teachers how best to use the application. She mentions there are too many opportunities for users to fail because of the plethora of buttons and menus. As a teacher, she wants something simple and obvious. Next, she turns her attention to Idle - the editor that comes bundled with Python. It’s good that Idle is free, has some syntax highlighting, auto-indents Python code, is cross platform, leightweight and simple. However, there are no line numbers, error reporting is incomrehensible to beginners and, most importantly, there are two separate windows that often get lost or confused with each other (one for code, the other for a sort of REPL). She suggests we turn out attention to a project called SonicPi, a sort of programmable music tool for the Raspberry Pi, as an example of the sorts of features teachers and learners desire in a coding environment. She enumerates features that may not immediately seem important for beginner programmers and teachers. All the panels are in the same window and it’s obvious what each one does. There are a limited number of obviously named buttons that encompass the core tasks required of the user. Zooming in and out is a killer feature for teachers. Simple things like line numbers and help for aligning code make a huge difference. Finally, she challenges the audience by asking, “Why can’t we have something like that for Python?” Being of a teacher-ish disposition she sets the assembled conference homework to be due in 2016. When I started work on Mu I watched the video mentioned above and sketched a rough outline of how Mu might work in terms of usability, reproduced below. Notice that while the details are obviously different, the core interface looks like Mu (if you’re wondering what “micro:ed” refers to - it was Mu’s original name until the BBC got shirty about it and I changed it to Mu). I simply took Carrie Anne’s suggestions and made the simplest thing possible. We find evidence of several people wanting a change to make their lives easier (we tend to ignore single case exacmples of desired changes). We use our issue tracking system built into GitHub as a way to come up with a tangible plan. We create the simplest possible solution and ask for feedback. In addition to providing answers about UX, Ann very kindly pointed me to various resources on the web that helped me to understand the challenges and work needed to do actionable UX research. Andrew Travers has blogged about a free pocket guide he has written on interviewing for research. I found this invaluable reading and helped me to prepare for the observations and interviews I conducted as part of the process of developing Mu. This is where I would start if I were new to UX research and wanted to get a quick overview of things to do. The Government Digital Service of the UK Government has an international reputation for software development greatness. The foundation of this reputation are the documents it releases, for free, that outline the “best practices” and expectations about process that GDS have about various aspects of the software development process. Their service manual on user research is a comprehensive outline of the various tasks, processes and outcomes needed to do effective UX research. I particularly found the section on analysis of UX research helpful. Finally, it’s good to read the suggestions, heuristics and best practice for working with users who have additional requirements when using software. Again, the UK government’s GDS has a number of resources, although I found this blog post on the Dos and don’ts on designing for accessibility (and the associated posters) to be a rich seam of useful advice. All their resources in this context can be found on their page about accessibility and assisted digital. Mu has a long way to go on its path to being an inclusive and accessible code editor, but what is certain is that UX is a core driver of this journey.